NOT the baby bird we saved. This one looks slightly better and less creepy. Photo by amberbrown1993. New baby birds are NOT cute. In fact, they are kinda creepy. They do NOT look at you with pleading beady eyes and ask, "Are you my mother?" Even if they did, it would NOT make a difference in my response, because I'd be too busy gagging and running away to answer. How did I come to learn these things? I happened to be eating lunch inside yesterday when I noticed a small, strange object with a bright yellow spot rotating around in the alley behind our house. First I thought it was a leaf. Then a piece of trash bag. 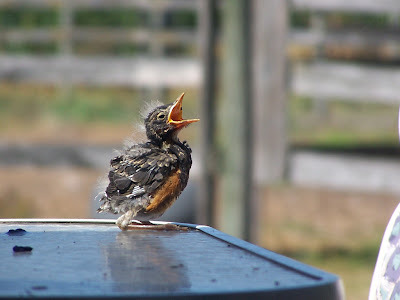 And then, I realized it was a baby bird, very new and very flightless, opening its beak wide in a pitiful cry as it pushed itself in circles on the blazing hot blacktop. I gagged on my food. "Lauren," I said to my roommate, "that's a bird. On the ground." Lauren didn't think twice. "We have to save it! I'll go get it!" she cried and raced to the closet to pull out kitchen gloves. I, however, remained rooted in my chair. Do we have to? I thought. Oh, the shame. The SHAME. I turned my eyes away from the window. All the chirping birds outside swelled into an accusing cacophany. Lauren was running around in full avian 911 mode, and I was sitting there eating a Caprese salad, ready to let this helpless little creature meet its natural fate -- all because I don't do well with animals period, much less injured ones, and definitely not ones that are dying or possibly dead. The guilt poured through me. I swallowed hard and caught up with Lauren outside, who had already picked up the baby guy and was cradling him in her beak-yellow gloves. He (I'm assuming it's a he, I have no idea how to discern bird gender) had pre-feather fuzz all over his pinkish-gray body. He looked like a mini-Thanksgiving turkey, just with head and beak still attached. I noticed a sibling of his, already lost to the natural order, laying a few feet away. "I have a box we can use," I said, eager for an excuse to move away from the body. I retrieved the packaging, added some paper towels, and brought it back for Lauren. Like a pro, she tucked him into his makeshift nest and brought him into the basement. Oh good lord ... now he was in our HOUSE. Cue fresh wave of guilt. Further ashamed, I called the Animal Welfare League, left a voicemail, and put out a plea on Facebook for assistance. Lauren sprang into action when my friend wrote back offering tips; she made an even cozier nest for the birdie baby and brought him back out to the tree where we found him. Stepping gingerly overly the dearly departed sib, Lauren propped him up near the branches so the mother could find him again and resume care. I watched. From about 6 feet away. And then ran back into the house as soon as we were done, relieved a) he hadn't died on our watch, and b) he hadn't stayed under our watch very long. As of today, our rescued pre-fledgling is alive in the cardboard nest out back, and his mother is bringing him snacks. Lauren deserves 27 gold stars for her heroic handling of this backyard crisis, and I am in awe of her compassion. But I am left struggling with the idea that a little, helpless, peeping bird didn't awaken my animal instincts (literally or figuratively). Why was my first instinct to turn away? Why did I so easily succumb to nature? Why was my excuse to say "that's just how the world works"? Why wasn't I willing to try? I let fear win outright. I didn't even investigate the situation. My sin was not to let nature take its course; it was to assume that I had no part in nature, and that I couldn't affect the course of a life, however little or faintly feathered. Dear little birdie, I hope you make it through the week. I'm really glad for your sake that Lauren was home, because you'd probably still be in the alley chirping -- or worse, gone -- if it had just been up to me. I've learned my lesson (I hope). Be it you or your next round of kin, I promise to do what I can to help. Because even if it doesn't work, the effort is meaningful. When I know I should act, give me courage to do it. When I act as I should, give me grace to do more. Turn fear into fuel, and make my second guess the final one. Thank God for repentance!What a great pair of women!